These are just a bunch of random graphics that I modified, hoping to improve them enough to include in the next Soldat version. Improved graphics include scoreboard flag and star icons, new flag textures, "missing flag" icons, minimap dots and more. Misc Graphics v0.1 ; Changelog below. arrow.bmp - The little triangle that appears above player's head. No major changes, just cleaned it up a bit. back.bmp - Background used in scoreboard and weapons menu. Original image was more detailed, but because it was also stretched out multiple times its size in-game - all that detail becomes an ugly blurry mess. This new image is just solid color with darker lines on the side, which looks much cleaner and less pixelated. 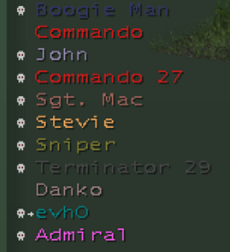 bot.bmp - Scoreboard icon that replaces ping for bots. Original icon was an image of a computer. New one is a clear label that says "BOT", which in my opinion is easier to understand. cursor.bmp - Crosshair. Cleaned it up a bit, made the dot in the center more precise, and improved visibility against bright backgrounds. 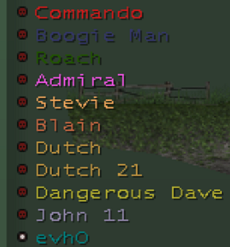 deaddot.bmp - Little icon in the scoreboard that appears to the left of the player name when the player has died. New icon has a little red skull in it. dot.bmp - Ping dot in the top-right corner. Remade from scratch to make it cleaner. flag.bmp - Flag caps icon in the scoreboard. Made it look more like a flag and less like some weird axe. noflag.bmp - "Flag Missing" icon in the bottom-right side of the screen when the flag is lost or stolen. I also included an alternative version with an exclamation mark beside the flag, let me know which you like better. See noflag v2.bmp in the .zip. scroll.png - The little blinking arrow on the right side of the scoreboard that appeared when scoreboard was too long. Before it was a Windows XP arrow. Now it's more Soldat-styled, and also tells you which keys are used to scroll the scoreboard. smalldot.bmp - Little circle icon that shows you, your teammates and flags on the minimap. It also appears to the left of your name in the scoreboard. Cleaned it up a bit, improved alignment with deaddot, made it better visible. star.bmp - Registered users star. No changes, just cropped the image a bit to improve the alignment. flag.bmp - CTF, HTF and Pointmatch flag texture. Cleaned it up a bit and made it more proportional to flag size. Original texture was square. infflag.bmp - INF flag texture. Same changes as above, but I also added a little Transhuman Design logo onto it because why not. jetfire.bmp - new jet flame graphic. Completely remade it and made more symmetrical compared to the original. The new one is more flat, but I also included an alternative version which is more round. See jetfire v2.bmp in the .zip. I would really appreciate your feedback on these. Especially the jet flames - I tried a lot of different versions but I'm not sure if they're any better, so I could really use more opinions. If you know of a mod that has even better replacements for some of these graphics - please link it in the comments. arrow.bmp - I don't see any changes at all, what did you clean up? bot.bmp - I am unsure about the color and size and the black border, it might be all good though, and deffenetly better than a computer. scroll.png - It's not centered for me (854x480) but not a problem. Very good idea. Can you make it smaller? 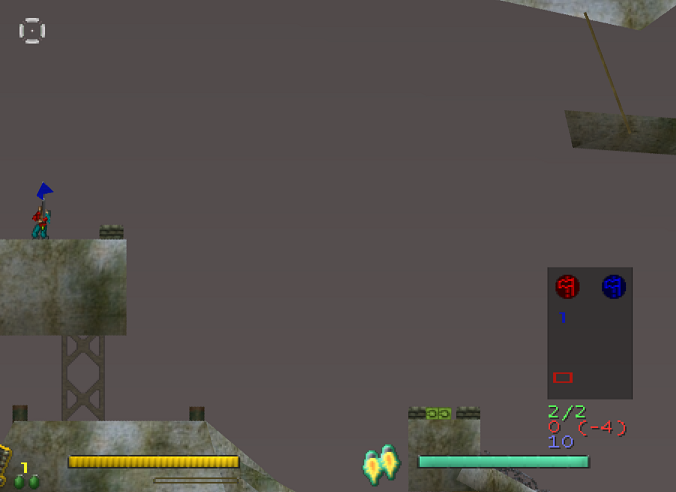 smalldot.bmp - When you die, the deaddot will be directly under it, I guess it's unavoidable because of minimap. star.bmp - You could make allignment even better by having 1 or 2 pixel rows of green above the star. 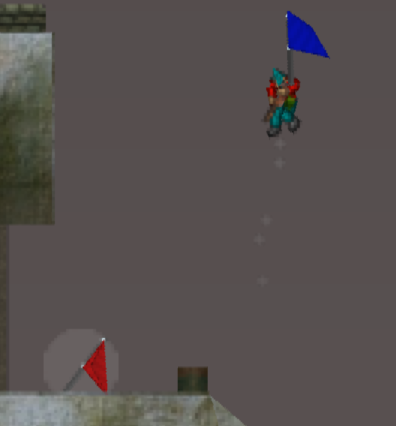 infflag.bmp - That looks cool, but not when flag is folded. jetfire.bmp - The first one is not bad. The edges feels more defined I think. If I choose red jet it kinda looks like I'm bleeding. When someone you argue with has a good point. I think the star icon needs to be removed and replaced with something more flashy that'll get someones attention and fits the soldat theme. but that 12x12 resolution really puts a limit on what you can do. I also think the csgo layout for cursor is pretty neat. arrow.bmp - It seems I included the original graphic in v0.1, not sure why I didn't save the modified one. :/ Either way the changes are minimal - I just made the pixels at the top symmetrical, for the OCD's sake. Not sure how to solve this yet. star.bmp - added a couple of extra pixels on the top to improve alignment. However the star icon is affected by the same problem as the flag icon, so we'll still need a solution for that. flag.bmp - made edges white and blurry as opposed to dark and sharp. This should improve the way flag looks when folded. infflag.bmp - same changes as above. Also included an alternative checkerboard version like the original texture. I don't think folded flags will ever look great unless they're just solid color. They need better physics, shading, and more polygons. So when they're not affected by momentum - they should still flap in the wind a bit instead of hanging limp. jetfire.bmp - fixed the alternative version so it has rounded corners. Left the first one unchanged though. Still not sure which one I prefer. What exactly do you not like? I can't really improve them if I don't know what to improve. To me they seem fine. AFAIK it never was centered and was always a bit closer to the bottom of the scoreboard. How should I make it smaller - the entire thing or just the lines? It's hard to make the icons in the middle any smaller because then the text will be unreadable. I could make the lines smaller, but I kinda like them as they are - they make it look a bit like a scrollbar. I actually like that the skull and the dot appear in the same spot - less clutter and less space wasted (pretty sure player will know when he's dead). I'd rather leave it that way. Also the dot has to be centered in the image instead of being in the corner, otherwise it'll be in the wrong position on the minimap. I never played CS:GO. What's its cursor like? I tried adding "Ping" to the ping dot, but it was near-unreadable and badly pixelated because there's no aliasing when the dot changes size. I still included it in v0.2 as an alternative though, so you can try it out if you want. I also made a version that's very similar to this. This one looks a bit better at smaller sizes and should still make sense to most players. flag.bmp and infflag.bmp White and blurry edges did the trick. I really like the chessboard style, aswell as the transhuman sign, not sure how to further improve it, it looks good even when folded. What's happening here? anything new? Please test it and give feedback people! I've attached new scoreboard flag and star icons at the bottom of this comment. The new icons were adjusted to be smaller, to accommodate this fix in the upcoming version. 1.6.8 version does not have this fix in place though, so the icons will appear very tiny there. @homerofgods: That ping icon looks much better, but it also has transparency... in a .BMP. How did you do that? o_O I can't even open the image in Photoshop because it can't parse the file. The flag icon looks nice in your post, but not so much in-game aunfortunately. :/ In-game it's upscaled to about twice the size, the color is much darker and aliasing is a lot more noticeable. This is why I went with a more simple straight shape in my version, so there's no aliasing and so the shape is easier to understand. Interesting. I'd like to use a smoother graphic for ping and this seems like an easy workaround, but I'm not sure if the devs would want such a "dirty" fix used in vanilla soldat. Would be nice if one of the devs could comment on that. Lo[one]r is the star and the flag icon good now? Looks like the number of caps and the flag are overlapping. Geez, when will people learn to write my name right..
arrow.bmp - no changes since previous version. The little triangle that appears above player's head. Very minor cleanup of the original graphic. back.bmp - no changes since previous version. A simpler, cleaned-up version of scoreboard and weapon menu backgrounds, to avoid ugly pixelation due to extreme upscaling. bot.bmp - changed it back to an image-based icon (without text, to avoid translation issues). Try it in-game and let me know if the icon is easy to understand. cursor.bmp - no changes since previous version. Small tweaks to make the cursor cleaner and better visible against bright backgrounds. deaddot.bmp - no changes since previous version. Little icon in the scoreboard that appears to the left of dead player's name. New icon has a little red skull in it. dot.bmp - used homerofgods' version from this post, but remade from scratch, made it a bit smoother and added shading. flag.bmp - downsized version for v1.6.9b1 with improved spacing. noflag.bmp - attached the version included in 1.6.9b1 as default. scroll.png - removed the white lines above and below the image to improve alignment. smalldot.bmp - no changes since previous version. Little circle icon that shows you, your teammates and flags on the minimap. It also appears to the left of your name in the scoreboard. Cleaned it up a bit, improved alignment with deaddot, made it better visible. star.bmp - downsized version for v1.6.9b1 with improved spacing, improved shading. flag.bmp - no changes since previous version. CTF, HTF and Pointmatch flag texture. Cleaned it up a bit and made it more proportional to flag size. Original texture was square. infflag.bmp - no changes since previous version. INF flag texture. Same changes as above, but I also added a little Transhuman Design logo onto it because why not. Also included a classic checker-board style INF flag at the root of the .zip file. jetfire.bmp - no changes since previous version. New jet flame graphic. Completely remade it and made more symmetrical compared to the original. The new one is more flat, but I also included an alternative version which is more round. See jetfire.bmp at the root of the .zip. -dot.bmp I shouldn't be the one to say anything about it since I suggested the design. Thanks for the feedback. Glad you liked the bots. In regards to small/dead dot - I think your version is easier to understand, but you forgot that smalldot.bmp is also used to show players and objectives on the minimap. The icon has to be symmetrical and centered otherwise it'll look bad on the minimap, unless devs can change them into two separate images - one for scoreboard and one for minimap. It looks to me we're done feedbacking and tweeking your new graphics. Shoozza, do you want me to commit the correct interface in trunk? @homerofgods, yeah please commit the changes. I'd like to have the classic graphics as well, so sure go ahead. Could you add the folder priority bugs to the bugtracker so I can look into that at some later point?